We Supply the Best Quality Tablas Online at the most Affordable prices - so if you have been searching for one your search ends here. We have expert craftsmen who craft the best quality tablas and so you can rely on us for the perfect tablas no matter if you are an expert or a novice. Let us start with giving a brief introduction of what a Tabla is . 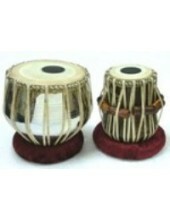 Tabla is a popular Indian percussion instrument of the membranophone family. 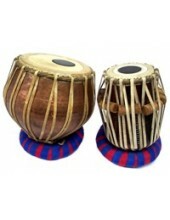 The word tabla is believed to be derived from an arabic word tabl which simply means a drum. You can also describe it as a pair of drums whose pitches can be varied and is played with hands. 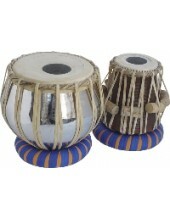 In Punjabi Tabla is also referred to as a Jori (implying a pair of drums). The Smaller Drum in Tabla played with the dominant hand is called 'Dayan' (meaning right), Chattu, Siddha or Dahina. It is made from wood (usually rosewood or teakwood) and is conical in shape emptied to almost half its depth. (Hollowing is important as it allows air to be present under the top membrane giving it its characteristic sound) . The Dayan can be tuned to specific notes; the tuning range is limited though Dayan's can be made in different sizes each having a different tuning range. Along the Sides of the Dayan Run vertical strings and between these strings and the drum side surface are placed wooden cylindrical pieces (also called ghatta). The Ghatta can be moved vertically to change the amount of tension in the sstrings which in turn infacts the tuning of the Dayan . The Other drum in the Pair of drums (Tabla) is a metallic drum called Bayan (also called duggi, dagga or dhama) which is made of metallic materials like Copper, Brass or Steel. Now if you ask whats the difference between the three, the answer is the quality of sound . Both the Tabla Drums have a skin at top (also called Puri in Hindi or Pura in Punjabi) with a central Area called Syahi (or Ink) and it is this area which has to be most carefully made by very skilled craftsmen as it directly effects the natural overtones of the Tabla. Tablas are in four different types (primarily based on the Material of the Bayan or the left Drum) ?